The guilt kept me up all night long. I was taking a break from the packed Astrodome Community Technology (ACT) Center that Technology For All had established on the ground floor. One of the survivors had my last name, and my coloring—a small dark woman with bright teeth and deep dimples. Jovially, she remarked that we could be family, and, inexplicably, it made me cry. The exigency and the proximity was more than I could stand at the moment. So I stepped out to get a hold of myself, silently wishing I had taken up smoking just to take the rawness off of my emotions. Oh, but God wasn’t done with me yet. A young girl that I had seen around the Astrodome before recognized me. I fumbled with an imaginary wrinkle in my shirt so I would not have to be kind to her. I hoped that she would see that I was desperately busy with my pretend wrinkle and could not be bothered. No such luck. She pounced. She ran to me and hugged me like the long lost sister I had become to her. I immediately perceived that she needed a bath. I pulled her off of me and reprimanded her about the impropriety of such actions. My boss, Will Reed, the CEO of Technology For All (TFA) and a Methodist Pastor, would have been appalled. 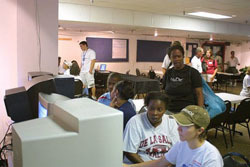 Will, TFA volunteer coordinator Pam Gardner, and Business Development Officer Jim Forest led the call for community technology centers in the area to do something to facilitate Katrina survivors' search for loved ones and ease the grief and distress associated with displacement. These individuals shaped a new model for the role for CTCs all over the country. 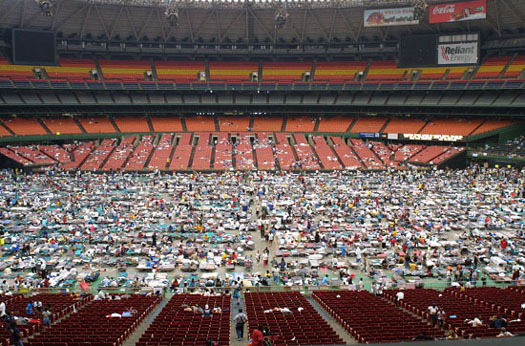 First, CTCs should be responsive: Hurricane Katrina hit August 29th, and the ACT Center was installed and fully operational on the September 2nd. Secondly, CTCs should be reactive and proactive. Setting up the ACT Center was challenging. Will was surprised that many “institutions involved did not immediately see the need” for an ACT Center. Moreover, such a large facility was “bound by so many preexisting relationships,” and it was hard to cut through the red tape. Technical problems needed to be dealt with, too. There were over 26 databases that had to be searched separately. With partners like SIMHouston, SBC, and Yahoo, the new ACT Center was able to make all the databases universally searchable so people could find loved ones. I wondered how Will and Jim dealt with being overwhelmed emotionally. I was struck when Jim got choked up a number of times, while Will kept focused on results with laser-like precision. As for me, I tossed and turned all night, thinking about how I treated that young girl, pulling her off of me instead of being there for her. I was assigned there the following Tuesday. And there she was in the same spot, as if she was still waiting for me. Everyone was crowded around her and her mother. I was enlisted to speak to the girl’s mother who wouldn’t move nor would she let her daughter out of her sight long enough to take care of herself hygienically. After being speculated about, generally distrusted, and cursed out, I finally convinced the mother that I was not there to harm her or her child. I persuaded her to let her daughter take a quick rinse off in a nearby ladies room. The girl was so grateful, gracious, and beautiful. Suddenly remembering my previous behavior, I felt ashamed to be in the same room with her. Very few people can chart the second, the instant that they grow. But that day I felt an enormous change. We are cups, constantly and quietly being filled with experiences, events, and consequences that forever change our nature. 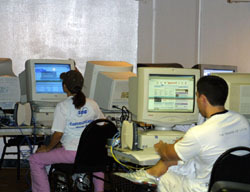 Technology For All will never be the same after its response to Katrina. And frankly, neither will I.
Nichole Payne is a new CTC VISTA this fall with Technology for All. She has a B.S. in Political Science and plans to continue her education up to the doctorate level.